A new EWG analysis has identified nearly 12,000 churches within 1,000 feet of fields of GMO corn and soybeans that are sprayed with increasing amounts of the “probably carcinogenic” weed killer glyphosate, first marketed by Monsanto as “Roundup.” Five thousand churches are within a mere 200 feet of the herbicide-tolerant GMO crops. In an earlier report EWG found that more than 3,000 elementary schools are located close to fields sprayed with glyphosate. Starting this year, moreover, GMO corn and soybean fields in 15 states that are sprayed with glyphosate may also be doused in 2,4-D, a weed killer that scientists have linked to Parkinson’s disease, hypothyroidism and suppressed immune function. The World Health Organization recently classified 2,4-D as a possible carcinogen. In seven of the 15 states where the Environmental Protection Agency has permitted farmers to spray this chemical cocktail of glyphosate and 2,4-D – marketed by Dow AgroSciences as "Enlist Duo" – at least half of all rural churches are within 1,000 feet of GMO corn or soybean fields. Those states are Indiana, Illinois, Iowa, Minnesota, Wisconsin, Nebraska and South Dakota. The unavoidable connection between GMO crops and increased use of toxic herbicides is one reason many people want foods with GMOs to be labeled. A recent Mellman poll found that 88 percent of consumers – regardless of age, race, education or party affiliation – favor requiring labels on GMO foods. Despite this overwhelming public support for GMO labeling, the House Agriculture Committee is considering legislation this week to block it nationwide. In particular, the House bill – dubbed the Denying Americans the Right to Know Act, or DARK Act, by opponents – would bar states from requiring GMO labeling and make it virtually impossible for the Food and Drug Administration to create a national GMO labeling system. 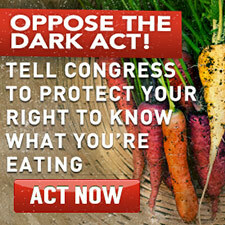 What’s more, the latest version of the DARK Act would block state, county and local laws that regulate how GMO crops are grown – including local laws designed to protect people from dangerous herbicides such as glyphosate and 2,4-D.
EWG approximated church locations using the ESRI (www.esri.com) landmark shape file for churches, derived from the U.S. Geological Survey’s Geographic Names Information System – churches layer. 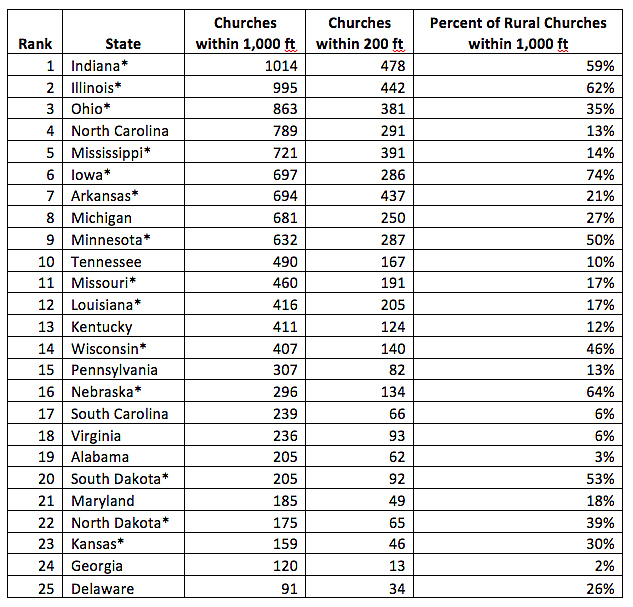 These are considered the best available data for national church locations. The data were filtered to the best of EWG’s knowledge to include only locations whose attributed name reflects an active church but may include some that are no longer in use. Zones within 200 feet and 1,000 feet of each church location were delineated using the school’s point location in the ESRI data, not the physical footprint of the entire church property. As a result, EWG’s analysis may over- or under-estimate the exact distance from the church grounds to the boundaries of nearby corn or soybean fields. Church locations were evaluated for proximity to the boundaries of corn and soybean fields as delineated in the USDA 2014 cropland data layer (30-meter resolution). 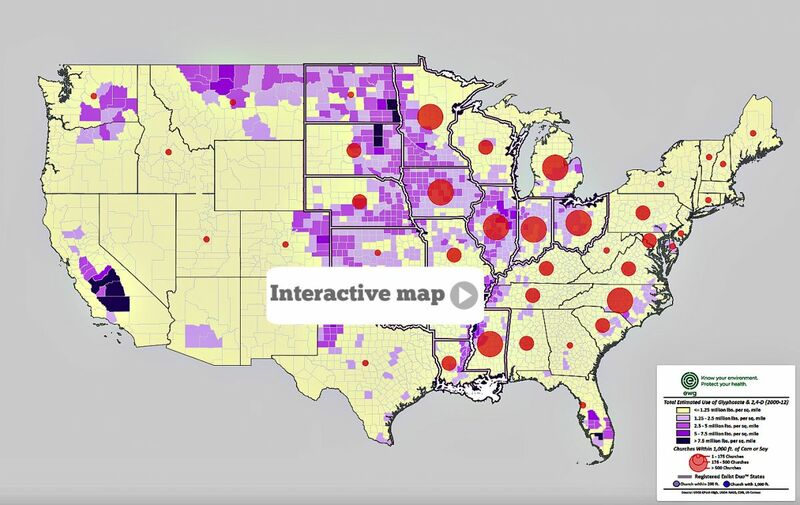 To establish a universe of “rural” churches, EWG only assessed churches locations that were not found within the boundaries of incorporated cities as defined by the 2010 U.S. Census populated places data. EWG acknowledges that spatial analyses of this kind may include some level of error (such as incorrect or outdated church or crop field locations or boundaries) even with standard, best available data sources. EWG welcomes information to revise and correct any location errors in the underlying data. Data on the acreage of genetically modified corn and soybeans were assembled by extrapolating from county-planted acreage using state percentages of biotech varieties by crop, as reported by the USDA. For corn, state level “herbicide resistant” + “stacked gene” varieties were used to extrapolate county-level planted acreage. For states not specifically listed in the USDA NASS Acreage Report, the category “Other” was used in the extrapolation. For soybeans, the state-level “all biotech varieties” was used to extrapolate planted acres at the county level. For states was not specifically listed in the USDA NASS Acreage Report, the category “Other” was used in the county extrapolation. Image by Paul Adams Photography.